A White House panel consisting of Brian Deese, Deputy Director, National Economic Council; Roberto Rodriguez, Special Assistant to the President for Education Policy; David Simas, Director and Aide to the Senior Advisor; and Ben Rhodes, Deputy National Security Advisor for Strategic Communications has been assembled to answer questions submitted via Facebook, Twitter, or the site itself immediately after the address.Other key members of the administration will be participating in online discussions throughout the week. President Obama himself will engage in a YouTube interview Thursday afternoon. Also on Thursday, there will be a live roundtable discussion featuring the Secretary of Health and Human Services Kathleen Sebelius, Secretary of Education Arne Duncan, Chairman of the Council of Economic AdvisorsAustan Goolsbee and Dennis McDonough, Deputy National Security Director. 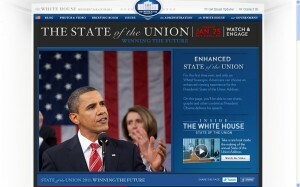 The page will stream the address live and also includes charts, graphs and other content to supplement the speech.